My name is Jim Nozaki and as a youth, like most young boys, "creepy-crawly" creatures always fascinated me. Fortunately (or unfortunately - if you talk to my Mother), I have never outgrown this fascination with them. I have kept all manners of invertebrates and reptiles through most of my life but my true calling with chameleons was not realized until my son received a Jackson's Chameleon from his grandparents as a present. 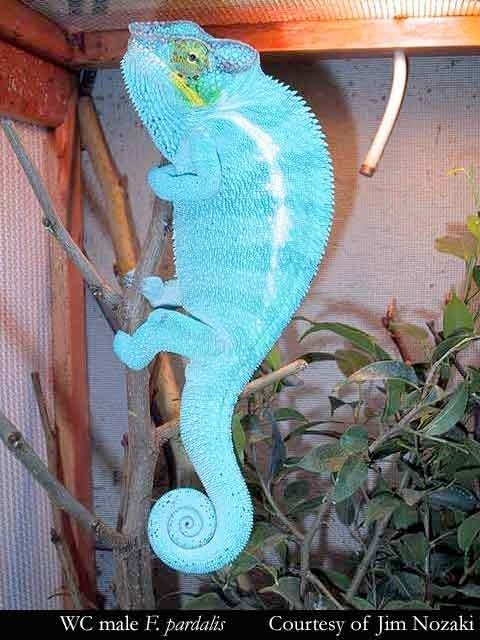 Long story short, from that point on, there was no turning back and that is how Amazing Blue Reptiles - a company specializing in the breeding of True Blue Nosy Be Panther Chameleons- came to be. We are a small, family run operation with emphasis on quality, not quantity and many thanks go to my very supportive wife, Mari, who does most of the work. Obviously, to a breeder, having the right breeding stock is the lifeblood of his business/hobby. 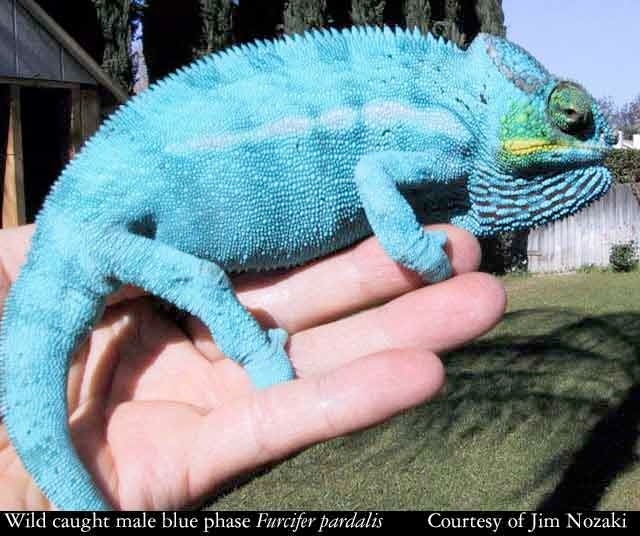 Like many people, I did not set out to become a breeder but because of the Blue Panther's captivating beauty, I initially acquired a male blue Nosy Be as a pet and, as with most other obsessions, one thing led to another. My first Panther happened to be a wild caught (WC) young adult. The true blue form of Nosy Be Panther is becoming difficult to find and I have not seen any outstanding specimens imported for quite some time. This particular animal was an adult with established colors. He was a medium blue specimen with yellow lips, orange radiating stripes on the eye turret and slight red speckling around his torso. The color quality of the animal was self-evident. After the initial mating, it will take the female 3-4 weeks to deposit her eggs and the incubation of the eggs can take from 7 months to a year. 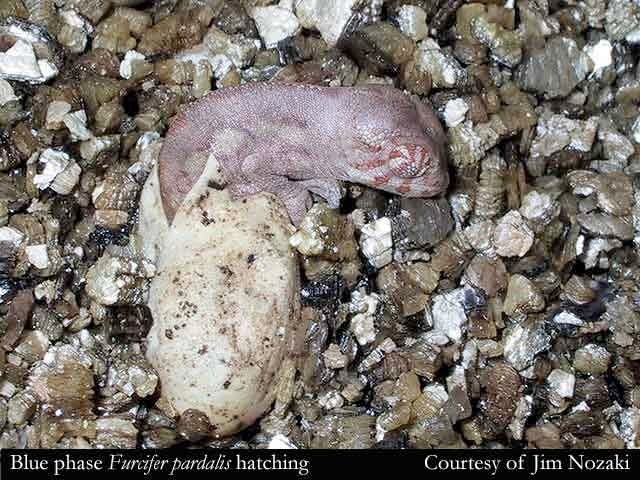 It will take another 6 months to a year for the hatchling to mature enough to indicate what color qualities have been passed on by the pairing of your animals. This whole process takes almost 2 years. From this example, I think it can be seen that it is very difficult and time consuming for breeders to establish quality bloodlines that a buyer can trust. While it is relatively easy for anyone to breed animals from Nosy Be and produce babies, it is quite another matter to selectively breed the right animals to produce the desired color qualities that everyone is seeking. There really is no secret when it comes to breeding true blue Nosy Be Panthers. The basic reality is that your animals must be in excellent health and kept in an optimal environment. The obvious fact is you must have a male with the right color qualities and equally important, but more difficult to identify, is a female that also carries the desired "blue genes." . As far as the color potential of the male blue Nosy Be is concerned, it is obvious simply by looking at the colors that the male displays. Unfortunately, you cannot tell what color potential the female possess simply by observing her. When Nosy Be females are sexually mature, they basically will show a pink/orange/rusty coloration throughout their body. Female Panthers, when they are juveniles and sub-adults, can show quite a bit of additional colors, especially right before they are sexually mature. They may posses the 'blue genes' that you so much desire or they may be of the emerald variety with no hint of the 'blue genes'. If your female is a WC or from an unproven blood line, you will not be able to discover the coloration potential of the female for quite some time. Since the male is only half of the genetic equation, the genes that the female carries are just as important as the male's. It is possible, though, that the female's genes may have more influence over color. 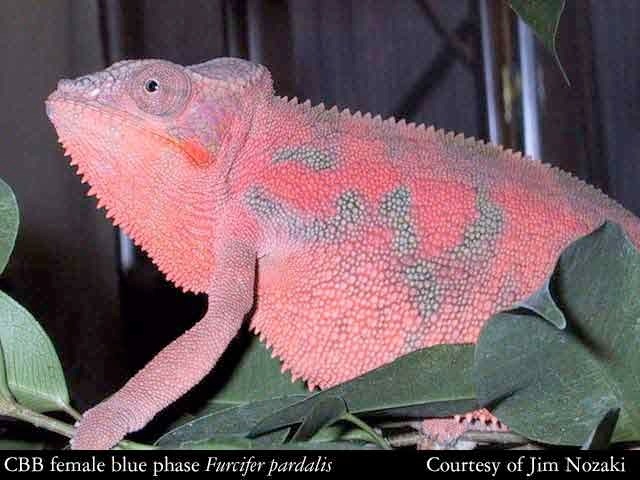 As an example: a blue male with quite a bit of red speckling throughout his body was bred to a female (whose brother did not have any significant amount of the red speckling). Their offspring turned out to have little or no red speckling. If the father's genes had played an equal role in the coloration of their offspring, it would stand to reason that at least some of their offspring would have exhibited some of the red speckling. Of course what I am stating here is an oversimplification of the genetic process but I think you get the point. 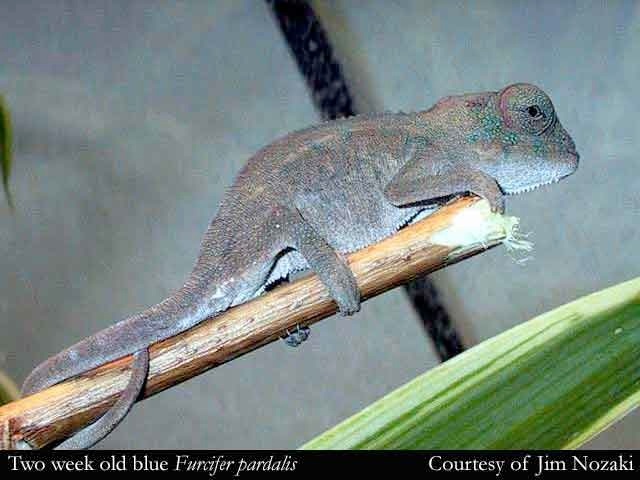 Breeding a blue male to a female from emerald bloodlines will not maximize the blue coloration of their offspring. That is the primary reason for breeding only females from known bloodlines that carry the blue color trait. When it comes to setting up your breeding stock, the bottom line is that you must be able to trust that the breeder for your animals has proven the coloration of their line (male and female). You can't go wrong when purchasing an adult male, as you will see the colors yourself but, when purchasing a female or juvenile, your own research can only take you so far. In the end, you must be able to trust the integrity of the breeder that they are indeed selling you an animal that is from proven bloodlines. Even if a female is sold to you from a reputable breeder, as F1, F2, or any other multi-generational tag, she is still an unproven female as far as your breeding efforts are concerned. Although the whole process is very time consuming, prove every bloodline in your group before making any claims. Likewise, when people buy from you (as a breeder), they are trusting that you have already proved your bloodlines before advertising that you offer "True Blue Nosy Be Panthers". Do not be the type of breeder that you would not buy from yourself! 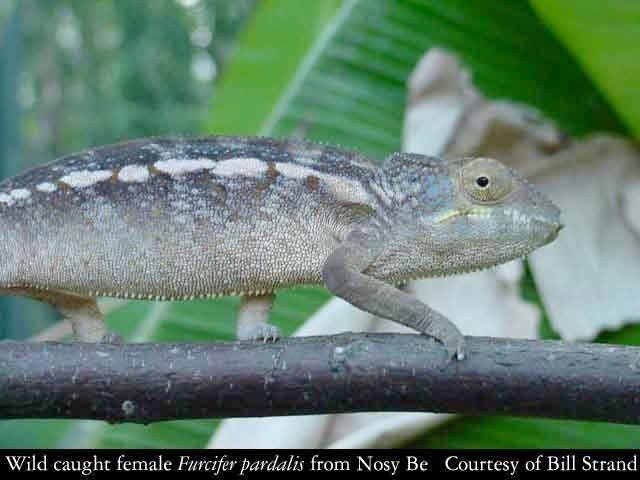 Let me emphasize again that the topic of genetics is very complicated and as yet, I do not believe anyone has even identified any specific phenotype (the visible properties of an organism that are produced by the interaction of the genotype and the environment) that have been isolated as being dominant or recessive traits in panther chameleons. And unfortunately, we cannot even use a Punnett square (an n x n square used to calculate frequencies of different geno/phonotype) to try to predict the outcome of a given pairing of animals. One of the factors that make it so difficult to study these traits in Panthers is that they are sexually dimorphic (differentiation between the sexes) as well as the fact that there are so many physiological aspects to their variation in coloration that studying them is a very daunting task to say the least. When it comes to blue Nosy Be Panthers, there seems to be an unknown factor that allows captive bred offspring to become bluer than either of the parents, basically outshining the coloration potential of their parents. It is possible for a turquoise colored animal to prodcue blue colored offspring. Some have speculated that this may be an environmental factor due to the decreased amount of exposure to natural sunlight (e.g. UVA and UVB rays) of CB animals. However, this intensifed blue coloration also seems to occur in CB specimens that are primarily kept outdoors in natural sunlight all year long. Another contributing factor may also be their diet. There is no way for us to duplicate the varied diet that a wild animal would consume in nature and it may be a lack of some trace element that precipitates this phenomenon. As yet, all that has been stated is anecdotal at best and has not been proven scientifically to my knowledge. 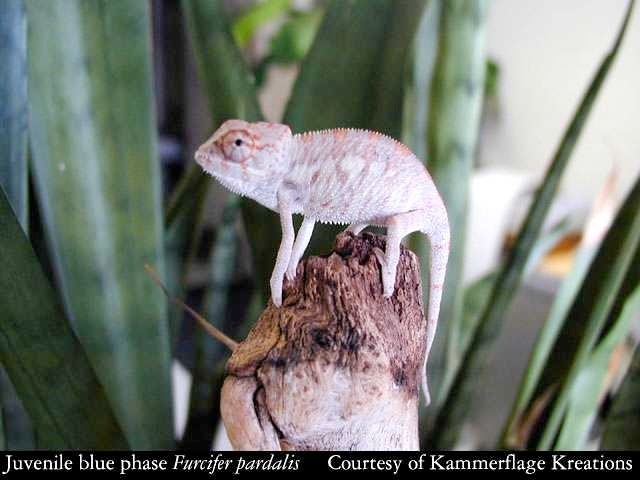 Inbreeding is another method that is used by some breeders to maximize the blue coloration. I do not plan on discussing the merits or any possible negative aspects of the inbreeding practice but I believe that no one can argue that genetic diversity is one of the key elements in the health of a given population of animals or of an entire species. Inbreeding has been practiced by many other herpeticulturists in their breeding colonies to bring out desirable traits in their snakes, geckos and other reptile species. 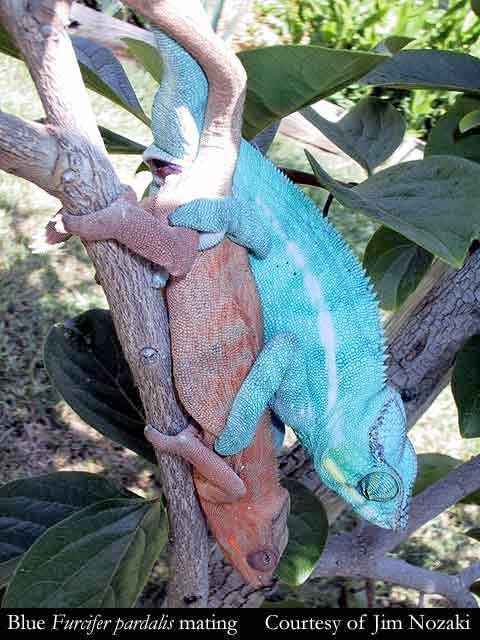 Although no obvious detrimental effects due to inbreeding have yet to surface (to my knowledge) that can, without question, be directly attributed to inbreeding, we at Amazing Blue Reptiles have made a concerted effort to avoid such practices for reasons of offering the highest level of genetic diversity. I would recommend others to avoid inbreeding if the sole purpose of it is to purify the color in your blue panthers. One of the methods I use to keep my breeders genetically diversified is to breed wild caught males (that are blue) to proven captive bred females that carry the blue trait. This method allows the introduction of new genes via the WC males into my breeding stock while maintaining the desired blue traits in the offspring. As stated earlier, it is becoming very rare to find true blue examples of wild Nosy BÃ© Panthers so introducing their new 'blue gene' is becoming very difficult. I have been very fortunate in that most of my best male breeders have been wild caught animals (see photos). 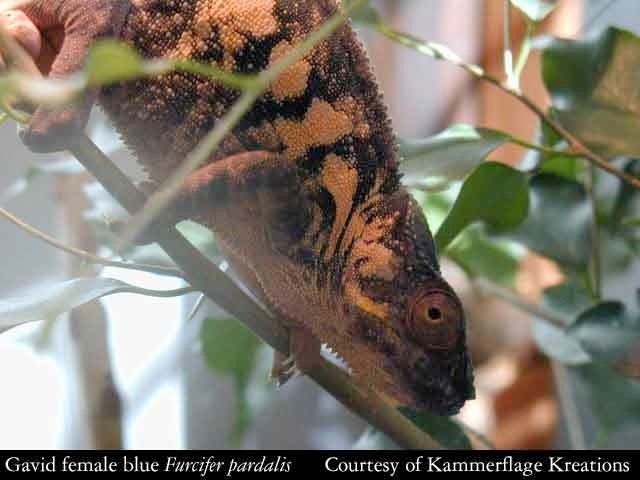 Arguably, the Blue Nosy Be Panther is one of the most spectacular examples of a chameleon that can easily be acquired by the average herpetoculturist. One only has to view some of the photos to see for themself their breathtaking beauty. Fortunately, there are a handful of breeders that specialize in these stunning and fascinating animals. 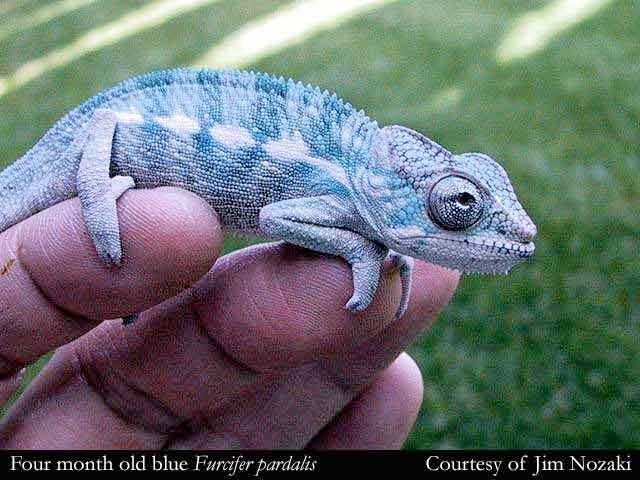 This makes it possible for the dedicated hobbyist to acquire a group of these True Blue Nosy Be Panthers without the headaches and heartaches that many of the breeders had to go through to establish their quality bloodlines. This wild-caught male is a valuable find. A male of this color quality can easily be the cornerstone of your breeding project. This wid caught female from Nosy Be has retained her blue cheeks and brown body color. This captive bred female has reached maturity. Her brownish body color has turned to a bright salmon color and her blue cheeks have become deep purple. This adult blue female is gravid. Her salmon pinks and blue highlights are replaced by orange and shades of blacks.